TFT will be shutting up shop for the foreseeable future due to changing work and family commitments. Just in time for the Socceroos' mad month of qualifiers (my sense of timing has never been good). Thanks to all who have taken an interest in TFT, and especially to those that have left their comments. Gratitude is also due to those who have kept me richly supplied with source material - they know who they are. The Oz football blogging community seems to be humming along nicely by now, and there's a healthy level of debate alongside the straight reportage. I may disagree with the various purveyors of opinion on the World Game site fairly often, but they certainly make an important contribution to the continued discussion of the game in Australia. And for in-depth tactical analysis of all the important games played here, Tony Tannous's blog remains an invaluable resource. Good luck to Pim and the boys in June...and here's to a splendid Version 4 of the A-League. A number of issues to touch on after a busy few days for Australian football. The embarrassment surrounding the non-playing of the Ghanaian national anthem could be taken as a harbinger of the evening as a whole, for the Socceroos' performance was largely embarrassing. Dull, blunt and strangely craven in the final twenty minutes (what is the point of cautiously sitting on a 1-0 lead in a home friendly?!? ), they provided little entertainment for the 29,000-strong crowd. At least Matthew Spiranovic is now "locked in", and there were one or two solid performances, notably from Jade North and, of course, Mark Schwarzer. Mile Jedinak, in his second appearance in Socceroo colours, again didn't look at all out of place. Dominant in the air and powerful in the tackle, he amply repaid Pim Verbeek's continued faith in him. He did, however, tire towards the close, and was tricked into a couple of needless fouls by Ghana's lively Prince Buaben. About Harry Kewell's performance, the less said the better. History may yet repeat itself, with our truncated Asian Cup qualifying group perhaps set to be emulated. If recent history is anything to go by, then the odds of Iraq being suspended are better than evens. A very sad state of affairs all round, and the talented crew who played so well to win the Asian Cup are entitled to considerable sympathy. The FFA yesterday refused to comment on what might happen, but with $3 million in ticket revenue at stake for a full-house clash with Iraq at Brisbane's Suncorp Stadium on June 1, officials are nervous. The Olyroos have marched on at the Intercontinental Cup in Malaysia, notching an impressive 3-1 win over Ireland, and discovering an unlikely hero in the process. I've never thought of Matt Simon as much more than a typical bustling battering-ram, but he certainly seems to thrive on confidence, and he could yet become a potent weapon for Graham Arnold at the Olympics. Certainly, his physical style is likely to trouble some defences. With Nikita Rukavytsya suffering his early injury, Simon has been granted an extended run in the team, and has grasped the opporunity...thus is history made sometimes. But Rukavytsya will surely get another chance before long. Aurelio Vidmar and Adelaide United deserve hearty congratulations. Their campaign has been scrappy and frequently ugly, but for an Australian club to reach the quarter-finals of the Asian Champions League represents a step forward for the A-League, without any doubt. How Vidmar must be thanking his lucky stars that he obtained the services of Sasa Ognenovski prior to the ACL group stage. The stalwart defender has come to Adelaide's rescue time and again, not least in the final minute against Changchun on Thursday. With Bruce Djite absent and Travis Dodd, Nathan Burns and Lucas Pantelis all playing out of position, Adelaide have been largely toothless in attack; it's fortunate for Vidmar that Adelaide's defence has been excellent throughout. To have avoided the might of Gamba Osaka and Kashima Antlers in the group stage clearly aided the Adelaide push and now, after having got past a side that’s sitting third from bottom in the Chinese Super League and the fifth-best outfit in Korea last year, the South Australians have a chance to measure where they’re really at in the Asian pecking order. Would you care to remind us where Adelaide finished in the 2007/08 A-League, Mr. McIntyre? Or would that perhaps not suit your book? Firstly and most obviously, the winners-only system for the first-round groups has been sensibly abandoned (as it was for the first round of World Cup qualifying in Asia, incidentally). The profusion of dead rubbers that habitually results from such a format is ruinous for gate takings, and by allowing the top two to progress from the opening groups, the AFC will surely be helping the clubs to offset the expenses of an ACL campaign (an important factor for Australian clubs). Just as a side note, a traditional top-two progression from the opening group would have allowed Melbourne Victory - believe it or not - to advance to the Round of 16 in the current competition, had it been played under the revised ACL format! Now to the matter of the revised allocations. Although, at first glance, the eastern side of the draw seems absurdly weighted in favour of "the big three" (Japan, China and South Korea), it makes sense in a way. Group F of the current competition has been a complete joke, with both Thai entrants Krung Thai Bank and the hapless Vietnamese club Nam Dinh conceding 27 goals over the course of six games. In Adelaide's group, Binh Duong have been similarly uncompetitive. The Vietnamese clubs clearly don't belong at this level of competition, although admittedly the new allocations seem a bit rough on the Thais, given Chonburi's commendable performances. But Thailand has fallen foul of the AFC's tough new "professionalism" requirements, with the result that they have to battle it out for a repechage place in the group stage. Uzbekistan and Qatar have suffered the same fate in the western half, the former having particular grounds for disappointment following the exploits of Kuruvchi in this year's Group A.
Australia, too, was given a less-than-favourable report card (what on earth does the word "threadbare" mean in that context, incidentally?). Some of the demands therein will be impossible to achieve by October this year (the promotion/relegation stipulation, for instance, which is a very long way off). Some compromise of sorts will no doubt be reached; there is no way that the AFC will bar Australian clubs from participation in the new competition. So the groups will at least be competitive, even if the competition loses some diversity as a result. And although the Australian teams will no longer have a "bunny" in the group to swipe relatively easy points from, the move to two group qualifiers should offset this up to a point. One innovation right out of left field is the guaranteed presence of an Indian club in the western half of the competition. TV revenue coming into play? Perhaps, but is interest in local football on the subcontinent (let alone the standard) really all that strong? Cricket's IPL has been a roaring money-spinner, but I'm not sure if the ACL would prove a similar cash cow in India. On the subject of Champions Leagues: felicitations to Manchester United on winning the European version for the third time. Not one of their best performances this season, but over the course of the competition they've shown themselves worthy of the honour, by and large. FNSW and the football community have been working extremely hard to foster a family atmosphere and thereby increase attendances and the enjoyment of the game overall. Foul language used by players and team officials is contrary to this endeavour and has no part in our game at any level. Effective immediately, match officials who officiate at matches where players and/or officials use any form of unacceptable language that is audible by the assembled spectators and the match officials, is to immediately stop play, dismiss the offending player or official and restart play in the appropriate manner. An automatic red card for swearing of any kind, in other words. "Audible by the assembled spectators" seems to have been interpreted somewhat broadly of late. And anyone who has played the game even at amateur, adult level would be aware of just how ridiculous this edict is. The majority of swearing that takes place on the field of play is directed at the player themselves, or at members of his/her own team. It's a perfectly natural reaction to disappointment in an adult, competitive situation, and attempting to curb it is a little like trying to wind back a sundial. It's interesting that the edict refers to a "family atmosphere". As it happens, a "family atmosphere" is precisely what most of the A-League clubs offer, and most of the clubs in the NSW Premier League, by and large, don't. And there are plenty of things that the NSWPL clubs could do to ameliorate this, but enforcing a blanket ban on swearing is frankly not one of them. Of course, excessive use of the richness of the English language is another matter, and there's certainly a case for sanctions if players (and, more particularly, coaches) provide a poor example. Sydney FC fans won't remember with much fondness Terry Butcher's expletive-ridden touchline diatribes, or Pierre Littbarski's "F--k you! F--k you!" spray at an opposition bench in 2005/06, both of which were faithfully captured on TV. Invective directed at the referee, too, is worthy of sanction; I had no problem with Matthew Breeze sending Steve Corica off for his "f--king cheat" remark in the Sydney v. Newcastle game in late 2006. Though if Corica had used the word "incompetent" instead, he would have been nearer to the mark. But back to NSW. Two things that I've noticed at NSWPL games this season: first, the referees have been highly selective in their swearing sanctions; second, despite being a little more careful about swearing, the players actually seem to be protesting (often in a quite petulant and futile manner) even more than usual. Just as bad an example to the young folk watching, in all truth. And, of course, any blanket ban on swearing begs the usual question (particularly relevant in the NSW Premier League): what about profanity in other languages? If the tetchy negotiations and media blurtings surrounding Bruce Djite's imminent overseas move appear somewhat familiar, there's a good reason. A little over two years ago, a similar situation was playing itself out in Melbourne, with Archie Thompson desperate to jump ship to PSV Eindhoven, where Guus Hiddink - his national team boss at the time - was supposedly going to lick him into shape for the 2006 World Cup. As it happened, of course, Thomspon was a complete cipher both with PSV and the national team in Germany...not that he could have known this at the time. Like Thompson, Djite has taken an unseemly swipe at his A-League employers, and like Thompson, Djite has now gotten his European wish. But although the hasty press dash by Adelaide's CEO looks like a cave-in on Adelaide's part, they may in fact have done a neat bit of business. Melbourne Victory's steadfastness in the Thompson case was perceived by many, at the time, as arrogant and self-defeating intransigence. In hindsight, it seems fairly clear that they actually provided a good example to other A-League clubs in dealing with the European market: they refused to be bullied into releasing their prime asset on unfavourable terms. Adelaide United appear to have learned the lesson well. Whether Bruce Djite is a prized asset for Adelaide is open to debate. Personally, I would rate him as promising, but a long way from the finished article. Yet Djite clearly considers himself a rare catch, and Adelaide, by their not-so-subtle initial over-valuing of the Olyroo striker, have craftily conveyed that impression as well. And consider this for a moment: Djite has had only two injury-interrupted seasons with Adelaide, he has yet to establish himself in the senior international side, and he had only a year of his contract left to run. Given all of the above, the rumoured $500,000 transfer fee for the Olyroo striker constitutes an excellent deal for Adelaide, I feel. Long-time readers of this blog will know of my fascination for the football culture in the most football-mad country on earth, Italy. 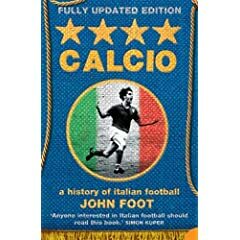 John Foot's Calcio - a history of Italian football attempts to condense that culture, and its antecedents, into one information-packed 500-page tome. On the whole, this aim is achieved very well. Foot's decision to group his material thematically rather than chronologically is a little disconcerting at first, but it ultimately saves the book from monotony. The only problem is that his first chapter, after the obligatory coverage of the game's early history in Italy, deals with referees...and it is perhaps the poorest, most repetitive part of the book, besides being strangely misplaced. Otherwise, his research is impressive, his prose crisp and readable, and his judgements apt. Throughout the book, it is hard to escape the theme of opaque accounting methods and offhand criminality in Italian club football, which Foot finally brings into the foreground in the hard-hitting final chapter. Yet he has plenty of time for the events on the field as well, explaining idioms of Italian football such as catenaccio, mediano and fantasista with solid clarity. As with all Torino stories, there was to be a final, weird twist to this tale. In 2000 Torino appointed a new president. He was a life-long Torino fan and had worked as a spokesman for FIAT. His name? Attilio Romero. The same Attilio "Tilli" Romero who had run over his idol - Gigi Meroni - in 1967. The club was now run by a man who had killed one of its most famous players, albeit by accident. This bizarre fact did not pass without comment. Some fans, unhappy at the performance of the team, took to shouting "murderer" at Romero. There are one or two factual errors in the book (and some bizarre, almost random misspellings), while some aspects of the Italian story are passed by somewhat perfunctorily. In particular, the chapter on foreigners in the Italian game (which does, admittedly, contain some fascinating material) concentrates almost entirely on British imports, not mentioning the pioneering trio of Swedes who had such success with Milan in the fifties. Their story deserved at least a few paragraphs, I feel...along with those of Michel Platini, Michael Laudrup et al. Although an air of pessimism is perceptible in many chapters, especially when Foot deals with Italian club football and its manifold insanities, he manages to capture some of the underlying beauty of calcio. His frequent (over-frequent, in all truth) quotations from the legendary journalist Gianni Brera serve to remind the reader that Italy has produced football literature of a very high calibre, consonant with the respect afforded to the game in Italy across a broad social spectrum. And Foot's own contribution to the literature of the game, in the shape of Calcio, is worthy of respect. The idea, of course, is enormously tempting. Many fans of the old NSL like nothing better than to belittle the standard of the A-League, contemptuously dismissing even the better sides as by no means comparable with the great NSL sides of the mid-nineties. And even now, there are those who will claim that the more decorated state league sides - even in their current, emaciated incarnations - would knock off the "plastic" A-League teams, given half a chance. Bring it on, then? Well...there are a few problems. Firstly and most obviously, the A-League and state league seasons do not align, as I've pointed out on this blog many times before (strangely enough, it's a point that people still wantonly ignore). Organising a cup competition around existing competitions would be an absolute logistical minefield. Secondly, a truly national cup competition (as opposed to, say, the Tiger Turf Cup in NSW) would involve considerable expense in terms of travel and accommodation. We've already seen how this factor has served to delay the introduction of a youth league; as with the youth league, these expenses would scarcely be covered by gate takings (let alone TV revenue, were a deal to be struck). But the most nagging concern is that some of the bitterness felt by the "excluded" state league clubs might spill over onto a more public stage. The South Melbourne v. Melbourne Victory friendly last year provided enough of a PR embarrassment; an escalation of the hostilities in the case of a genuinely competitive game is not hard to envisage. As for Lynch's idea of the winners being allotted a spot in the Asian Champions League...frankly, it's farcical. Somehow I think the AFC might have a problem with Kashima Antlers or Gamba Osaka playing at Jensen Park. In the long term, a cup competition would be great. But not just yet, thank you very much. Scott McIntyre, SBS's Asia expert, has penned a provocative piece on the World Game site dealing with this season's Asian Champions League, and the participation of Australian clubs therein. Normally I find McIntyre a shrewd and informative scribe, but this time I feel he's got things badly wrong. There are a number of reasons why Australian clubs are still likely to lose their collective step in the ACL, and most of them simply have to do with ours being a fledgling competition, and a relatively minor player in the Asian money stakes. McIntyre's assertions that we can match the buying power of Vietnam and Thailand (!) are barely relevant in this respect: it's the Japanese and Koreans who are, of course, well out in front. Adelaide, under the stewardship of Aurelio Vidmar, has shown they’ve learnt from the experience of a failed campaign but are yet to strike a decisive blow against comparatively weak opposition this year (the 6th best side in Korea last year, for example). I would be the first to criticise Adelaide's play at many stages of the current campaign (they were abysmal for considerable periods last night, and Vidmar's tactics were again quite inexplicable), but let's be fair here. Last season, they may have fallen well short of qualification for the quarters, but they notched two wins and two draws in a demanding group (they fared, in fact, almost as well as Sydney FC...a fact which is rarely acknowledged). Describing this as a "failed campaign" when it was their first foray into the competition is misleading to say the least, given the laudatory epithets that were attached to Sydney FC's corresponding efforts (not least by some of McIntyre's SBS colleagues). "Yet to strike a decisive blow"? Four wins and one draw is a decent showing in anyone's language. Long-haul Asian competitions are, in any case, more about staying the distance than striking decisive blows. Back to the Japanese clubs. They may indeed have good youth systems, superior scouting networks and plenty of home-grown talents. Such is often the case with an established, and well-administered, competition. The J-League began in 1993; the A-League in 2005. Certain pundits need to be reminded of that on a daily basis. Yasuhito Endo and Michihiro Yasuda are, indeed, quality players who have come through the J-League's youth ranks. Due to the J-League's financial pull (and, perhaps, to issues of cultural familiarity), they have stayed there. If they were Australian, they would undoubtedly now be playing in Europe...another point frequently missed by the usual crowd of A-League denigrators. Another point: McIntyre's arguments are generally made with reference to Gamba Osaka, who have played such excellent football this time around. But how about the Urawa Red Diamonds, whose players signally failed to match the wonderful spectacle provided by their fans in 2007? Sydney FC played them off the park in the final group game in Japan, and but for David Zdrilic's clumsy headed miss (compounding Ufuk Talay's penalty miss two weeks earlier), it would have been Branko Culina's men into the quarter-finals at the expense of the eventual winners of the event. Why also are we trotting out the tired excuses about Australian clubs being at a disadvantage due to being out of season – where there are no injuries, no travel concerns and no disharmony. Oh dear. Cassio? Bruce Djite? As for team harmony, McIntyre might be interested in the ongoing Bobby Petta situation...or the mysteriously brief appearance of Dez Giraldi last night. But there is one crucial issue that McIntyre has ignored. And that is the continuing, infuriating situation of last year's A-League winners taking part in the competition. Since their stunning 2006/07 triumph, Melbourne have lost their key creative player, and the 2007/08 season showed quite clearly how much they had relied on him. Add to this the loss of Archie Thompson and Carlos Hernandez for the ACL campaign itself, and it's not hard to see why they have stumbled badly in the continental competition. Adelaide have done a little better, but they too look prosaic by comparison with 2007/08 high-flyers like Newcastle and Queensland. Australia's best? Not by a long shot. Australian teams still have plenty to learn in Asian competition, and they must approach the ACL with a healthy humility. But they are not remotely as far behind the top dogs in eastern Asia as McIntyre implies. The Mark Milligan saga of the last few days has certainly cast a pall of bad temper over the Olyroos' preparations for Beijing. Although Milligan is no stranger to no-show controversies (as any Sydney FC fan could confirm), securing his club future should indeed be his first priority at the moment, and if the FFA were in fact told about his intended whereabouts this week, they don't come out of things particularly well. Once again, the Olympic football tournament is not of paramount importance, and a training camp in Townsville four months out from the tournament should not take precedence over fixing a place of employment for the forthcoming season. ...seems fair enough to me. Milligan remains an enigma. His form can be infuriatingly unpredictable: he can put together an immaculate series of displays at the back, combining calm elegance on the ball with excellent reading of the game and intelligent, crisp passing, and then produce an absolutely shocking performance, such as that we witnessed against Perth Glory in December. After Milligan's fine run of form in the first season of the A-League, I jokingly suggested to my Well-Informed Covite friend that at least we'd have him for a few more months before he went to Europe. Two months and several Milligan howlers later, a text message from W.I.C. assured me that we'd have him for a few more months before he went to Blacktown. Even his brief spell with the Socceroos at the Asian Cup was marked by such Jekyll-and-Hyde form: after a magnificent display against Thailand, he gifted the Japanese their only goal of that miserable quarter-final with a trivial error. It probably is time for Milligan to take the European plunge. Like a few other young A-Leaguers, he appears in danger of stagnating if he stays any longer. Arsenal is surely a pipedream, but a good, patient Euro manager, a tougher league, and a longer season could all help him to realise the potential that he so clearly possesses. A few recent events in games I've watched have given me cause to consider the offside rule (the infamous Law 11) and its current interpretation. In particular, the increasing tendency for officials to ignore "passive offside" in some cases...usually, unfortunately, the wrong ones. First case: Michael Essien's spectacular strike against Liverpool early in extra time in this week's Champions League semi-final second leg. The "goal" was ruled out because, in the referee's opinion, Pepe Reina in the Liverpool goal had been unsighted by two Chelsea players in offside positions. I believe the referee made the right decision in this case, but there have been other cases when straightforward, solo goals have been ruled out due to players "unsighting" the goalkeeper. A few years back, a stunning strike by Roberto Carlos for Real Madrid was ruled out due to the offside position of some other attackers, but the idea that they had been interfering with the goalkeeper's line of vision was, in that instance, patently absurd. Then there was the case of Danny Tiatto, in his Manchester City days, slashing through the Middlesbrough defence and scoring a peach of a goal in a tense Premiership game. Again, it was ruled out due to another player's offside position...despite the fact that, not only was the goal scored from only a few yards, but the player in question was virtually outside the goalkeeper's possible line of vision. It's this sort of passive offside that is so often noticed. But there is another, more subtle type, which is frequently ignored. Second case: Pippo Inzaghi's first goal of a very fine hat-trick against Livorno last weekend. Here's what happens: Clarence Seedorf threads the ball through to Kaka on the left, and the latter crosses nicely for Inzaghi - positioning himself intelligently as always - to tap in at the far post. Kaka is onside when Seedorf plays the initial pass...so what's the problem? The problem is that Inzaghi is offside, not when Kaka crosses to him, but when Seedorf plays the initial pass. And the speed of the move is such that Inzaghi gains a significant advantage from his original offside position. This is the sort of case where "passive" offside is actually no such thing, but the play is rarely called back in such circumstances. There was a similar goal in a Manchester United v. Leeds Premiership game some years ago, Dwight Yorke being the "passive" offsider on that occasion. The current trend of not signalling offside until the offsider has touched the ball is not helping. To my mind, this convention is largely pointless and only leads to confusion and wasting of time. Additionally, though, it seems to be encouraging teams to hope for a continuation of play even when the ball has obviously been played forward to a player in an offside position. And this brings me to my third case: the Bankstown v. Blacktown NSW Premier League game this afternoon. Midway through the second half, with Bankstown 3-0 ahead, the ball is played up to Blacktown's centre-forward Chris Bedzo. He is many yards offside, and both he and the Bankstown defenders relax. Yet there is no immediate call...because Bedzo has not touched the ball. Suddenly, Blacktown's Jordan Simpson comes charging forward from midfield, racing for the ball. Of course, the whistle comes, the play is called back. Absolutely correct, since the initial ball was clearly aimed for Bedzo. Yet the Blacktown players assail the referee with complaints. The indignation is incredible! This unreasonable expectation that the play should be continued even in situations like this is directly attributable, in my view, to the "not 'til he's touched it" convention. For obvious reasons, if a ball has been played forward in the direction of the player furthest forward and that player is offside, the play should be called back. It is palpably unfair on the defending side otherwise. Well, the 2008/09 season of the A-League has landed, with the first round featuring a grand final replay and a Sydney-Melbourne grudge match (or perhaps, on the basis of last season's encounters between the two teams, drudge match is a more appropriate description). It's pleasing to see that breaks have been scheduled for international weeks this time, although given that the A-League-heavy Olyroos have now finished their qualification series, the words gate, horse and bolted spring to mind. But it's a sensible step. More important news, however, is the continuation of the Hyundai sponsorship (under much improved terms, I have been reliably informed). Certainly the impressive attendances in Season 3, and the exposure of the A-League "brand" in Asia through the medium of the Asian Champions League, would have put the FFA in a strong bargaining position. A Saturday night final? Probably a wise move, although it's hardly the startling innovation that it is being presented as. There has been a distinct lack of news on the A-League's complementary youth competition as yet, however. Perhaps the recruitment of players and technical staff is simply being undertaken quietly and efficiently, but one would have expected some coverage of the clubs' efforts in this area by now. Meanwhile, the acquisition of another very youthful talent by the Queensland Roar, presumably as a member of the senior squad, rather exemplifies some of the awkward anomalies that an essentially amateur youth league may engender.